U.S. players walk along the pitch after France scored a second goal during a women's international friendly soccer match at the Oceane stadium in Le Havre, France,on Saturday. 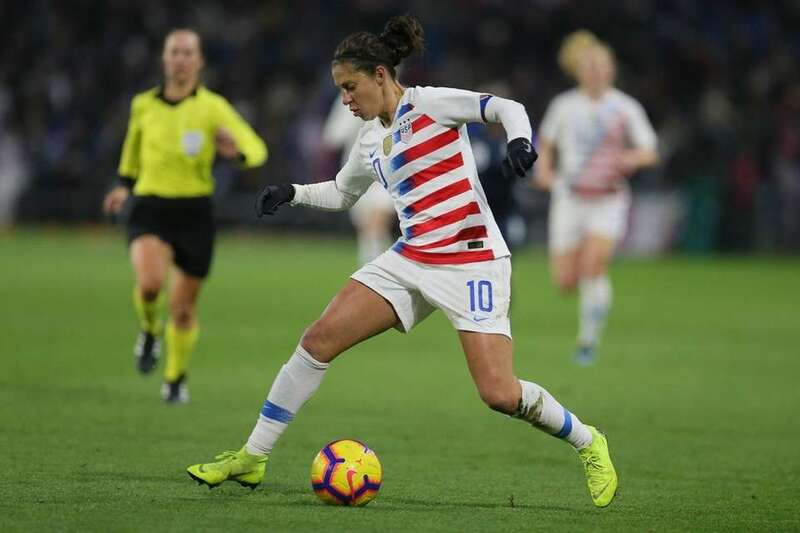 U.S. forward Carli Lloyd controls the ball during a women's international friendly soccer match between France and the United States at the Oceane stadium in Le Havre, France, Saturday, Jan. 19, 2019. 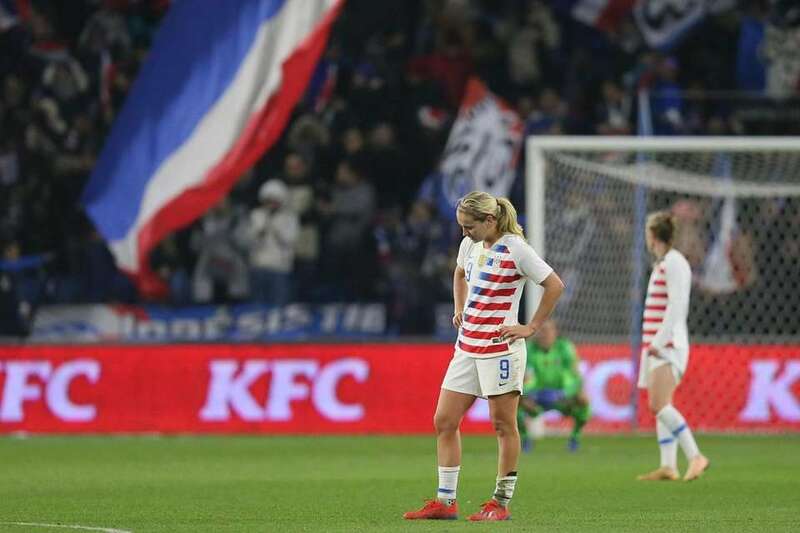 U.S. midfielder Lindsey Horan stands on the pitch after France scored its third goal during a women's international friendly soccer match between France and the United States at the Oceane stadium in Le Havre, France, Saturday, Jan. 19, 2019. 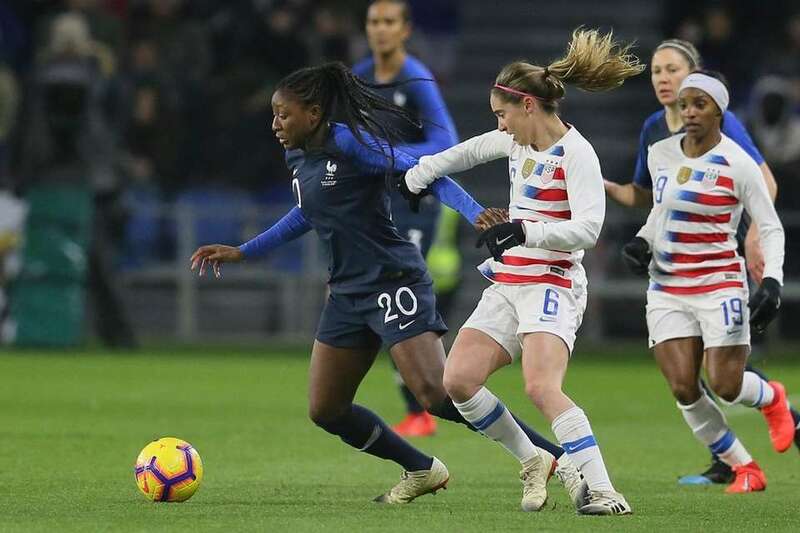 France forward Kadidiatou Diani, left, vies for the ball with U.S. midfielder Morgan Brian during a women's international friendly soccer match between France and the United States at the Oceane stadium in Le Havre, France, Saturday, Jan. 19, 2019. 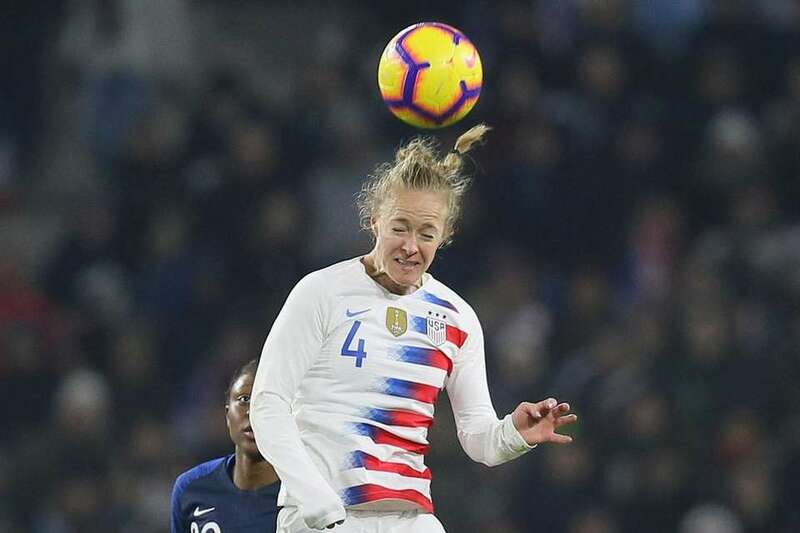 U.S. defender Becky Sauerbrunn heads the ball during a women's international friendly soccer match between France and the United States at the Oceane stadium in Le Havre, France, Saturday, Jan. 19, 2019. 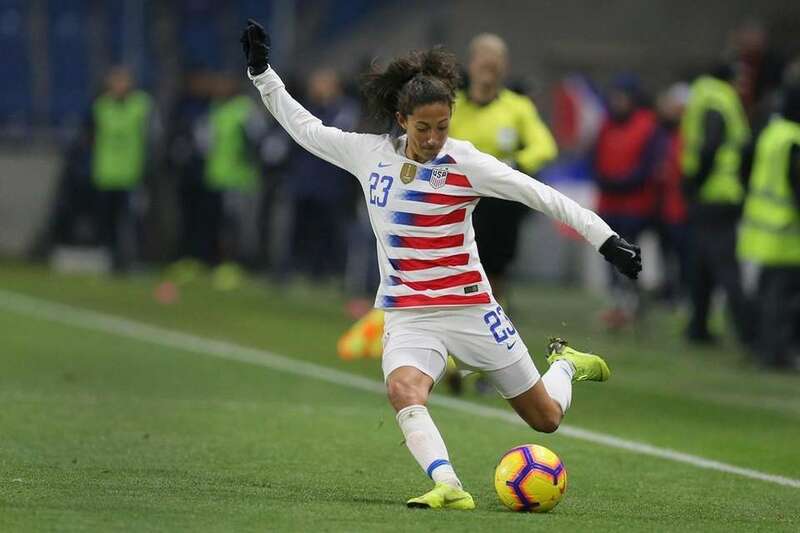 U.S. forward Christen Press shoots the ball during a women's international friendly soccer match between France and the United States at the Oceane stadium in Le Havre, France, Saturday, Jan. 19, 2019. 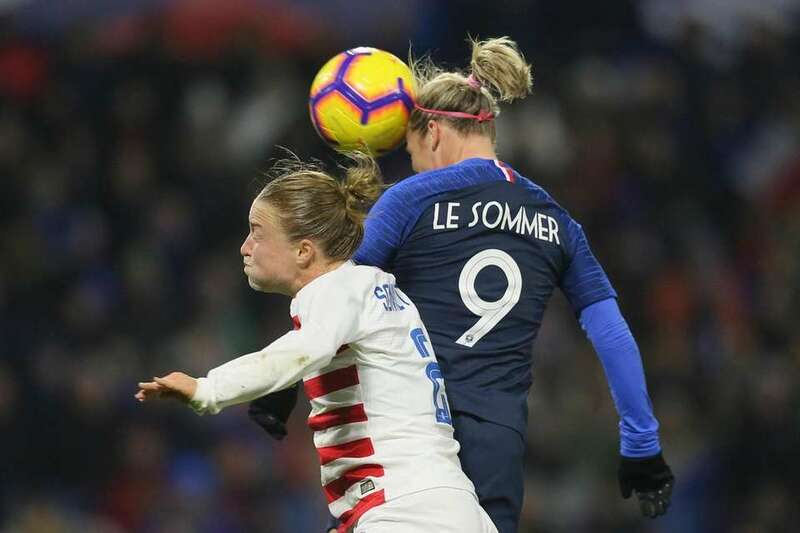 France forward Eugenie Le Sommer, top, goes for a header with U.S. defender Emily Sonnett during a women's international friendly soccer match between France and the United States at the Oceane stadium in Le Havre, France, Saturday, Jan. 19, 2019. 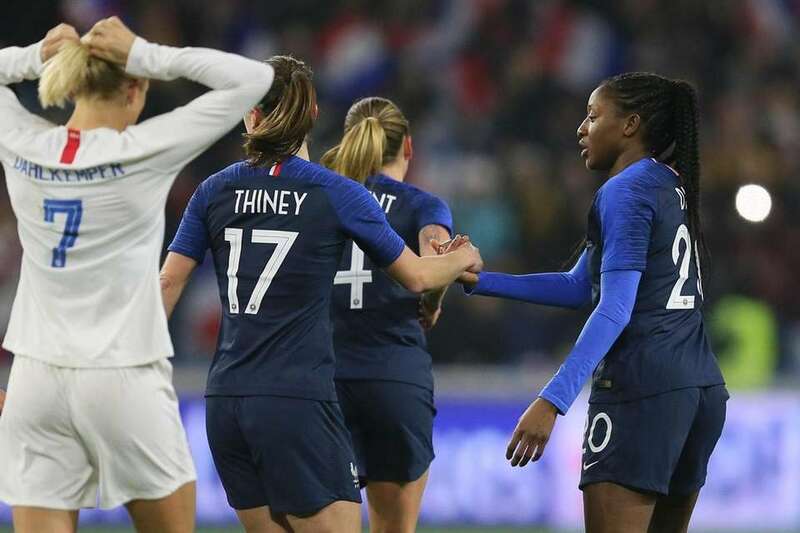 France forward Kadidiatou Diani, right, celebrates with teammate Gaetane Thiney after scoring the opening goal during a women's international friendly soccer match between France and the United States at the Oceane stadium in Le Havre, France, Saturday, Jan. 19, 2019. 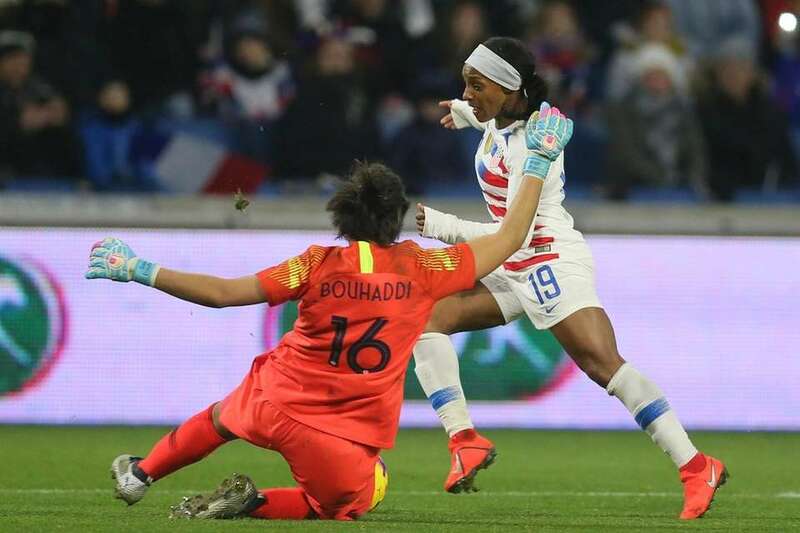 U.S. defender Crystal Dunn, right, challenges France goalkeeper Sarah Bouhaddi during a women's international friendly soccer match between France and the United States at the Oceane stadium in Le Havre, France, Saturday, Jan. 19, 2019. 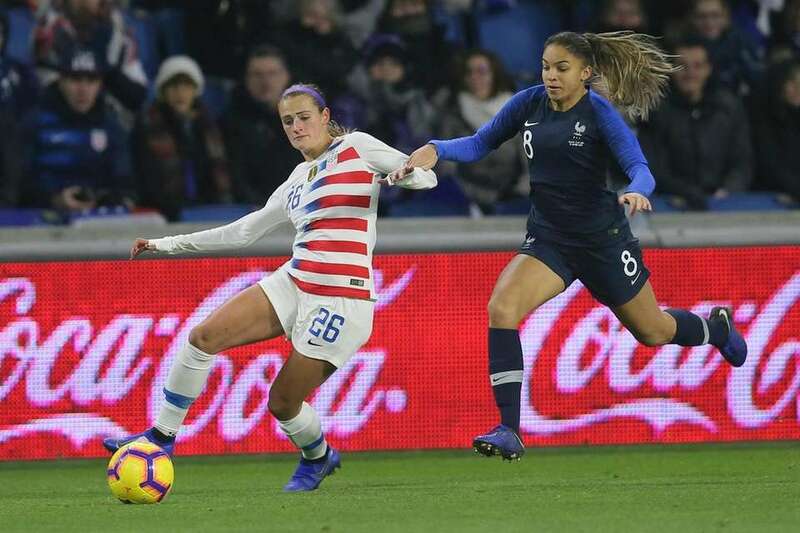 France forward Eugenie Le Sommer, left, vies for the ball with U.S. defender Tierna Davidson during a women's international friendly soccer match between France and the United States at the Oceane stadium in Le Havre, France, Saturday, Jan. 19, 2019. 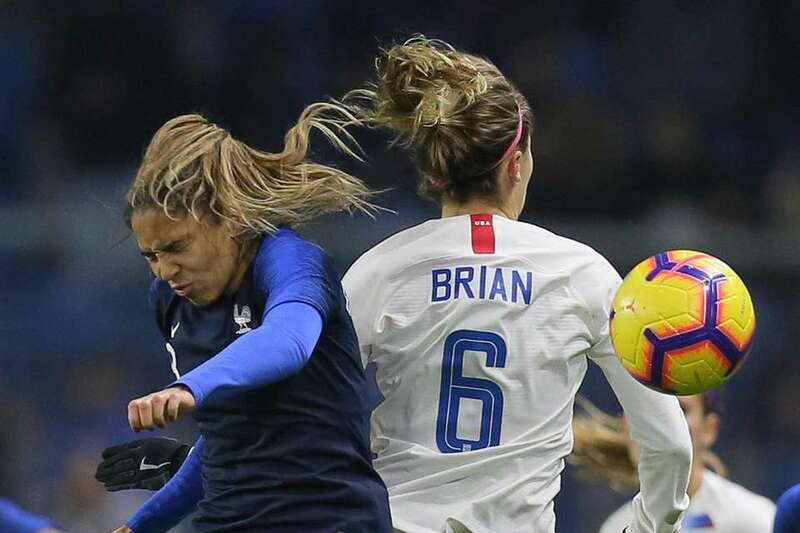 France forward Delphine Cascarino, left, vies for a high ball with U.S. midfielder Morgan Brian during a women's international friendly soccer match between France and the United States at the Oceane stadium in Le Havre, France, Saturday, Jan. 19, 2019. 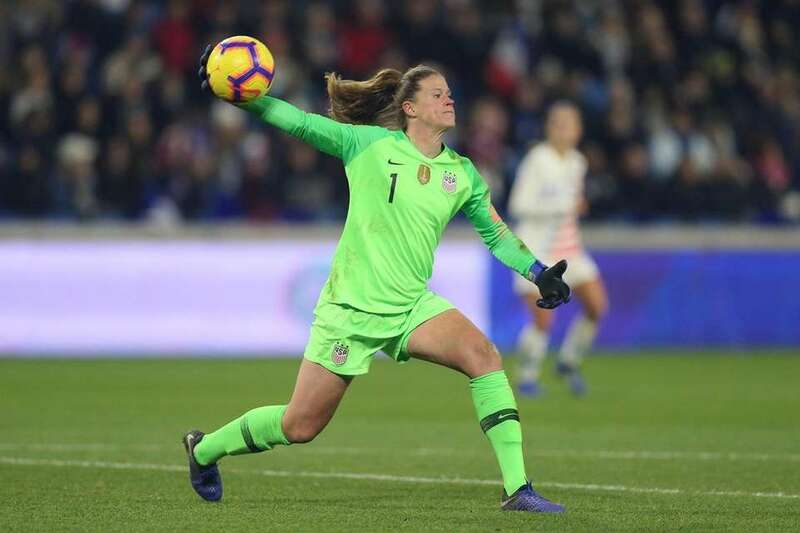 U.S. goalkeeper Alyssa Naeher throws the ball during a women's international friendly soccer match between France and the United States at the Oceane stadium in Le Havre, France, Saturday, Jan. 19, 2019. 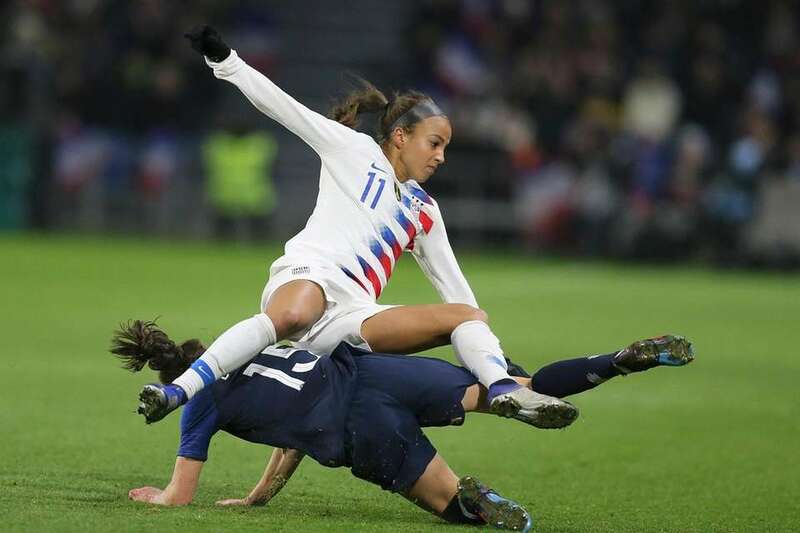 U.S. forward Mallory Pugh, top, collides with France midfielder Elise Bussaglia during a women's international friendly soccer match between France and the United States at the Oceane stadium in Le Havre, France, Saturday, Jan. 19, 2019. 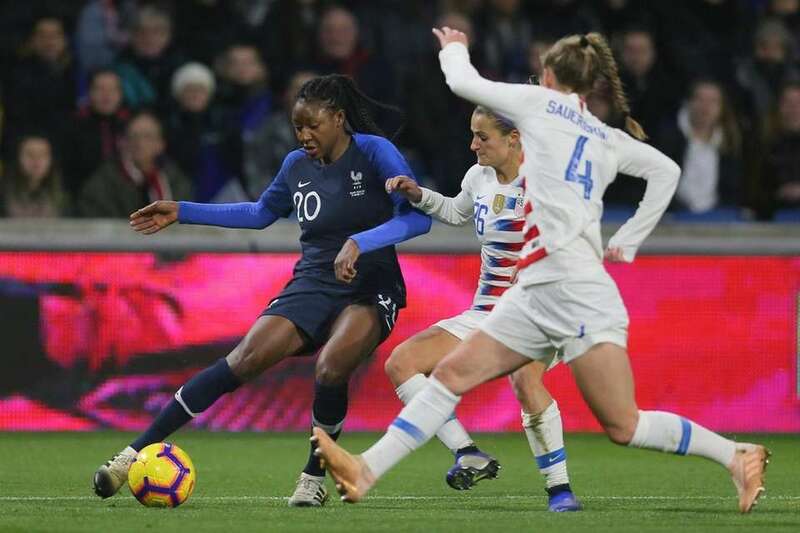 France forward Kadidiatou Diani, right, battles for the ball with U.S. defenders Abby Dahlkemper, left, and Emily Fox during a women's international friendly soccer match between France and the United States at the Oceane stadium in Le Havre, France, Saturday, Jan. 19, 2019. 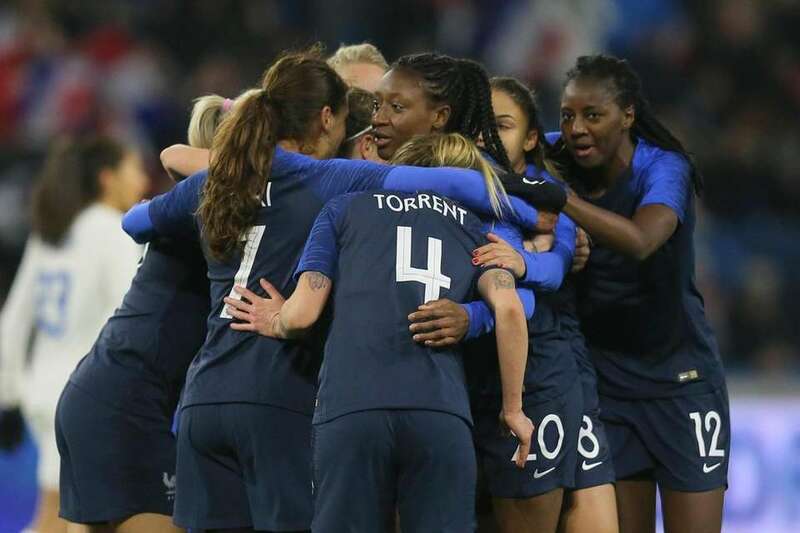 France players celebrate after teammate Kadidiatou Diani, centre, scored the opening goal during a women's international friendly soccer match between France and the United States at the Oceane stadium in Le Havre, France, Saturday, Jan. 19, 2019. 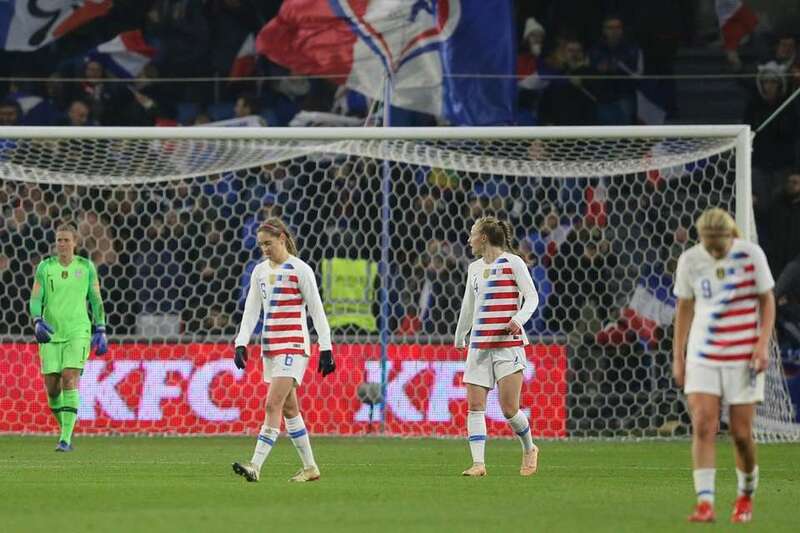 France forward Marie-Antoinette Katoto, centre, vies for the ball with U.S. forward Christen Press, left, and defender Becky Sauerbrunn during a women's international friendly soccer match between France and the United States at the Oceane stadium in Le Havre, France, Saturday, Jan. 19, 2019. 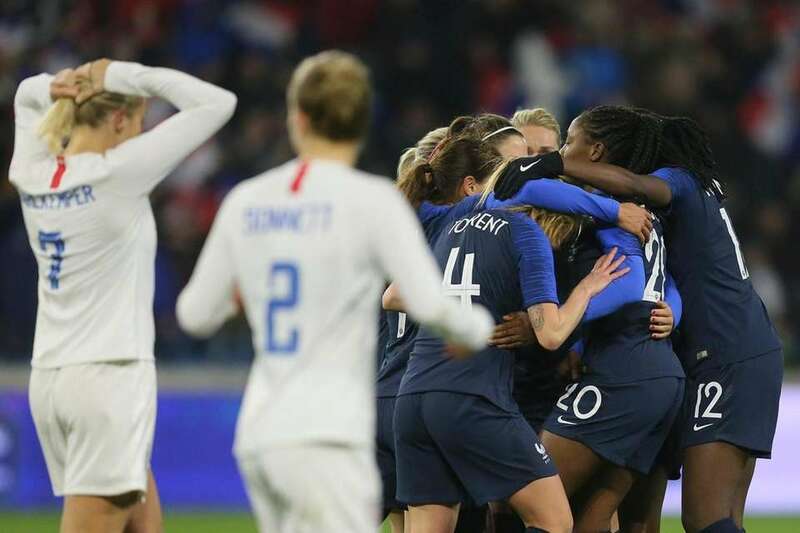 France players celebrate the opening goal during a women's international friendly soccer match between France and the United States at the Oceane stadium in Le Havre, France, Saturday, Jan. 19, 2019. 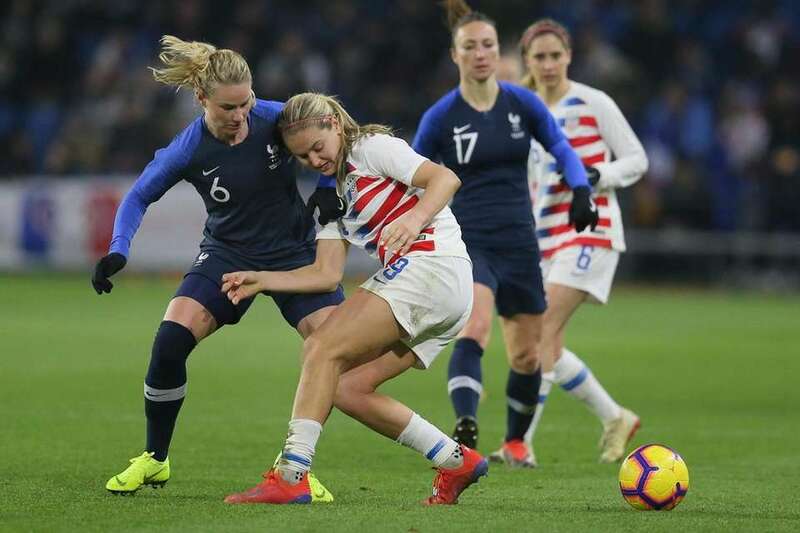 U.S. midfielder Lindsey Horan, second left, battles for the ball with France midfielder Amandine Henry, left, during a women's international friendly soccer match between France and the United States at the Oceane stadium in Le Havre, France, Saturday, Jan. 19, 2019. 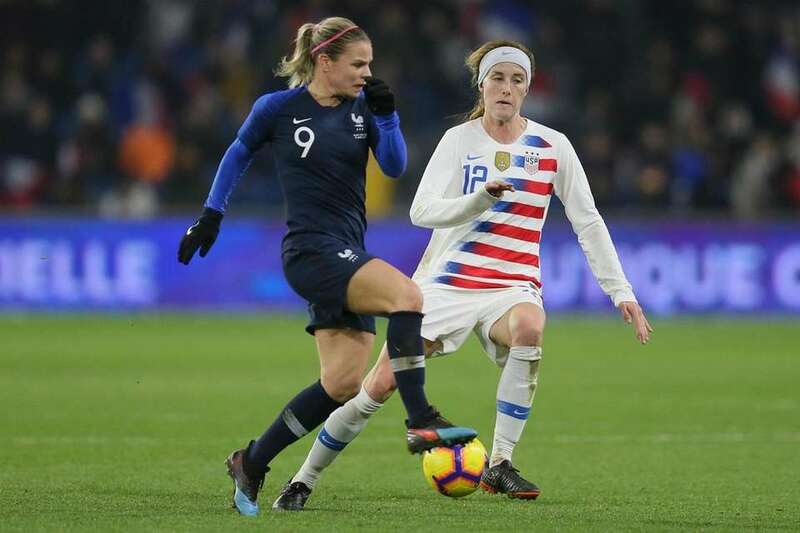 U.S. midfielder Lindsey Horan, right, vies for the ball with France midfielder Amandine Henry during a women's international friendly soccer match between France and the United States at the Oceane stadium in Le Havre, France, Saturday, Jan. 19, 2019. 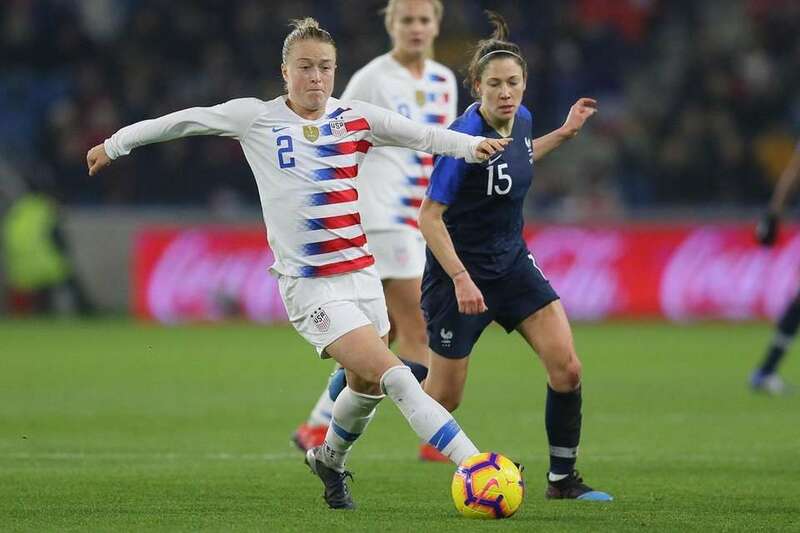 U.S. defender Emily Sonnett, left, runs with the ball next to France midfielder Elise Bussaglia during a women's international friendly soccer match between France and the United States at the Oceane stadium in Le Havre, France, Saturday, Jan. 19, 2019. 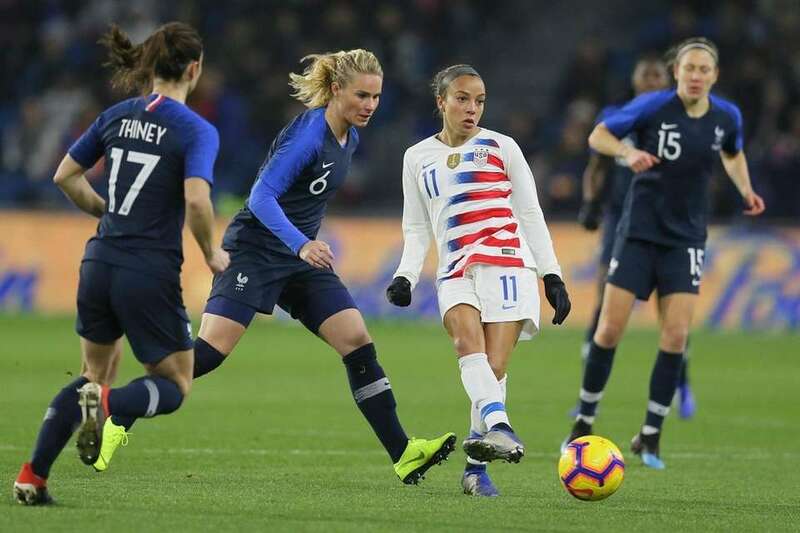 U.S. forward Mallory Pugh, right, shoots the ball next to France midfielder Amandine Henry, second left, during a women's international friendly soccer match between France and the United States at the Oceane stadium in Le Havre, France, Saturday, Jan. 19, 2019. 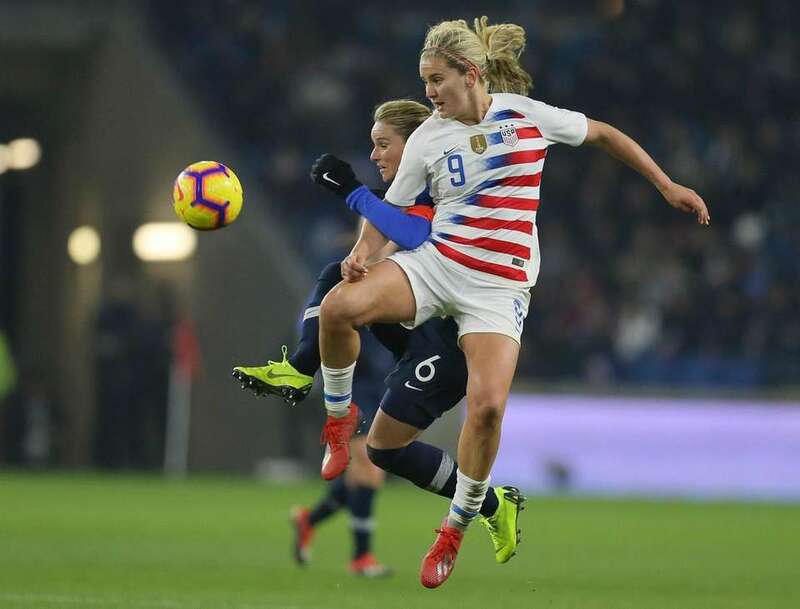 U.S. defender Emily Fox, left, tussles for the ball with France forward Delphine Cascarino during a women's international friendly soccer match between France and the United States at the Oceane stadium in Le Havre, France, Saturday, Jan. 19, 2019. 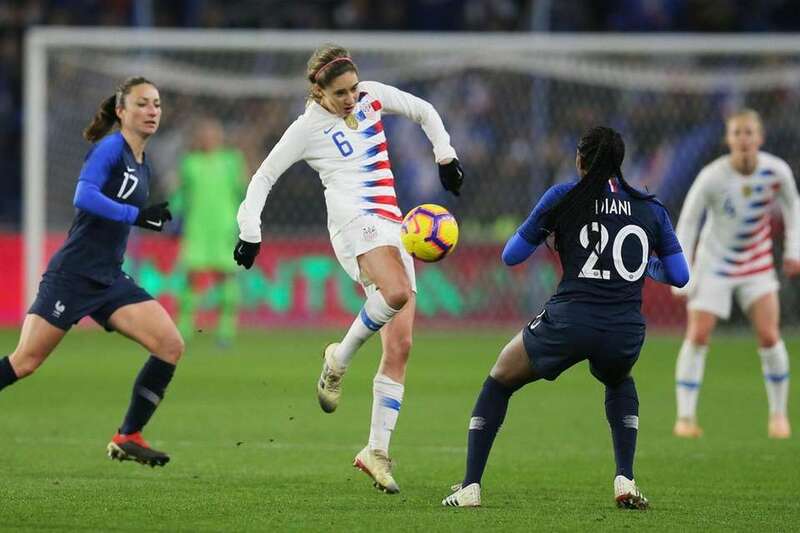 U.S. midfielder Morgan Brian, centre, vies for the ball with France forward Kadidiatou Diani during a women's international friendly soccer match between France and the United States at the Oceane stadium in Le Havre, France, Saturday, Jan. 19, 2019. 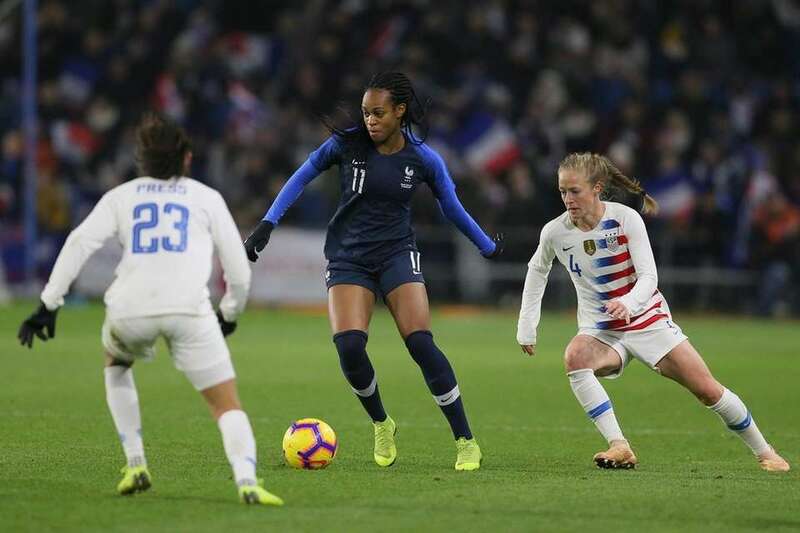 France forward Kadidiatou Diani, left, vies for the ball with U.S. defenders Becky Sauerbrunn, right, and Emily Fox during a women's international friendly soccer match between France and the United States at the Oceane stadium in Le Havre, France, Saturday, Jan. 19, 2019. 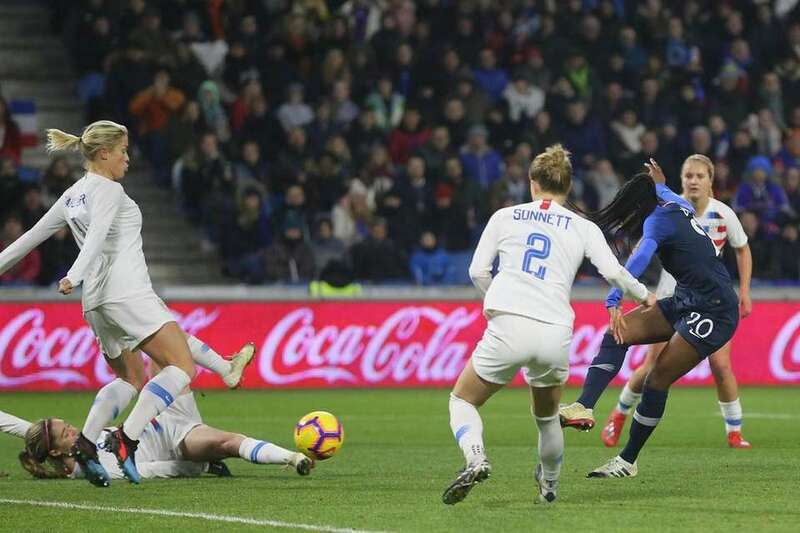 France forward Kadidiatou Diani, right, shoots the ball to score the opening goal past U.S. defenders during a women's international friendly soccer match between France and the United States at the Oceane stadium in Le Havre, France, Saturday, Jan. 19, 2019. 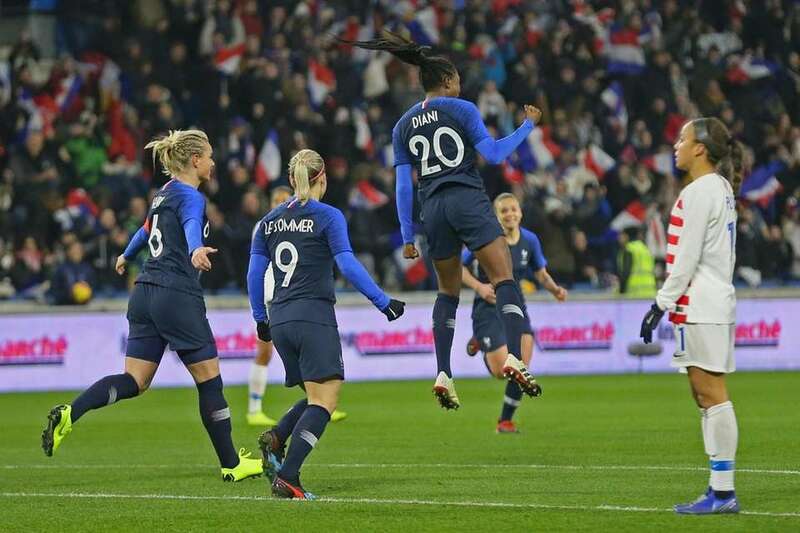 France forward Kadidiatou Diani, top, celebrates after scoring the opening goal during a women's international friendly soccer match between France and the United States at the Oceane stadium in Le Havre, France, Saturday, Jan. 19, 2019. 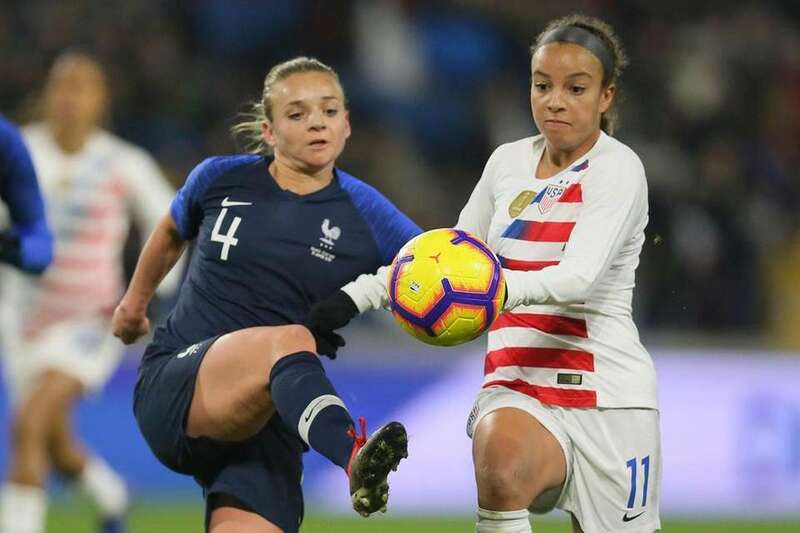 U.S. forward Mallory Pugh, right, vies for the ball with France defender Marion Torrent to score her side's goal during a women's international friendly soccer match between France and the United States at the Oceane stadium in Le Havre, France, Saturday, Jan. 19, 2019. 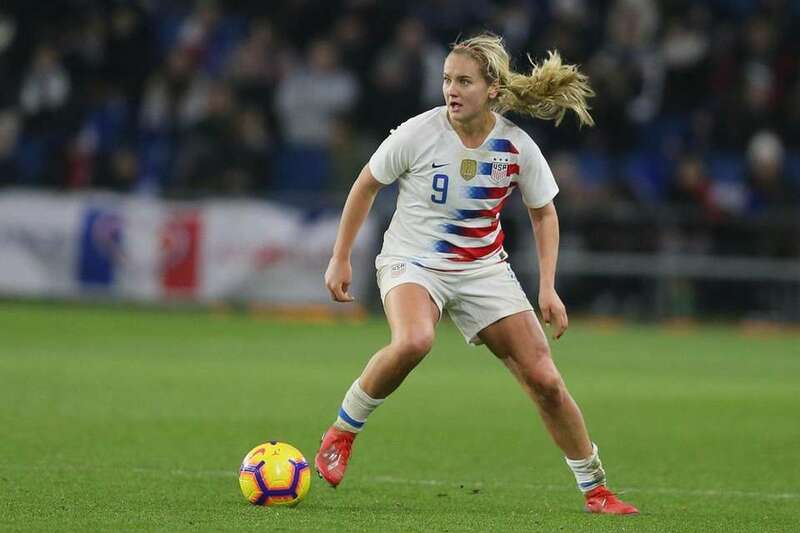 U.S. midfielder Lindsey Horan runs with the ball during a women's international friendly soccer match between France and the United States at the Oceane stadium in Le Havre, France, Saturday, Jan. 19, 2019. 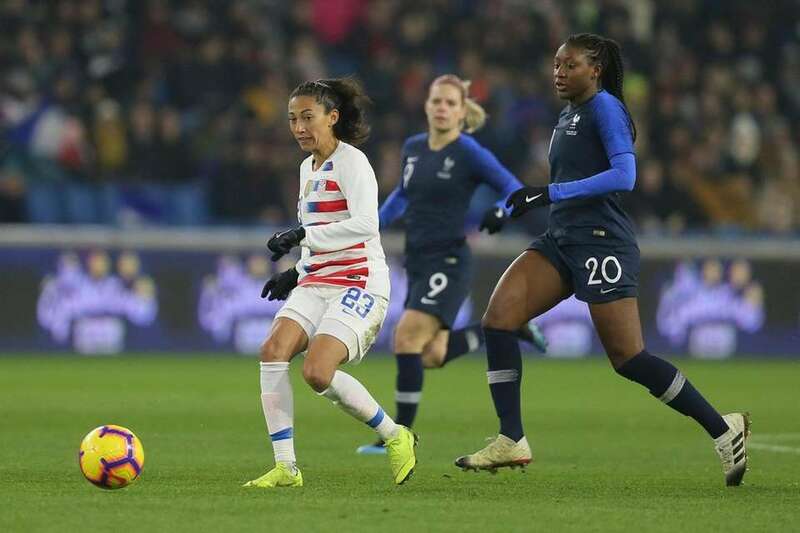 U.S. forward Christen Press, left, runs with the ball next to France forward Kadidiatou Diani during a women's international friendly soccer match between France and the United States at the Oceane stadium in Le Havre, France, Saturday, Jan. 19, 2019. 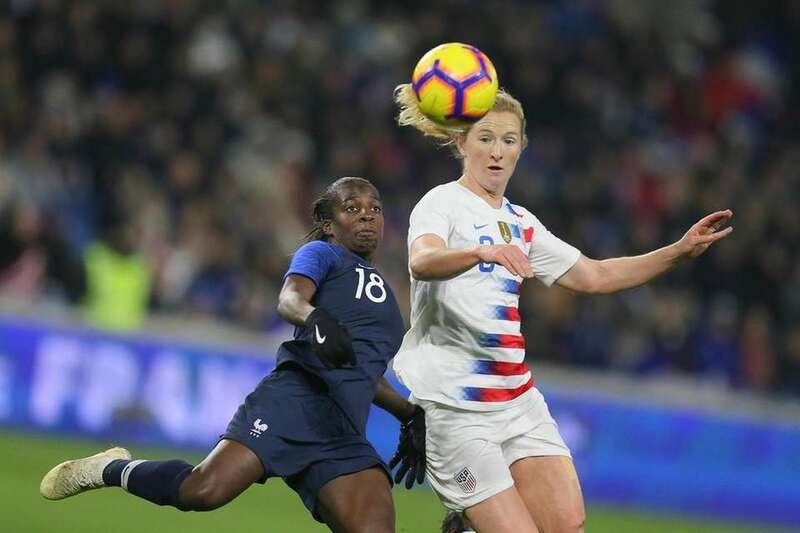 France forward Viviane Asseyi, left, vies for the ball with U.S. midfielder Samantha Mewis during a women's international friendly soccer match between France and the United States at the Oceane stadium in Le Havre, France, Saturday, Jan. 19, 2019. 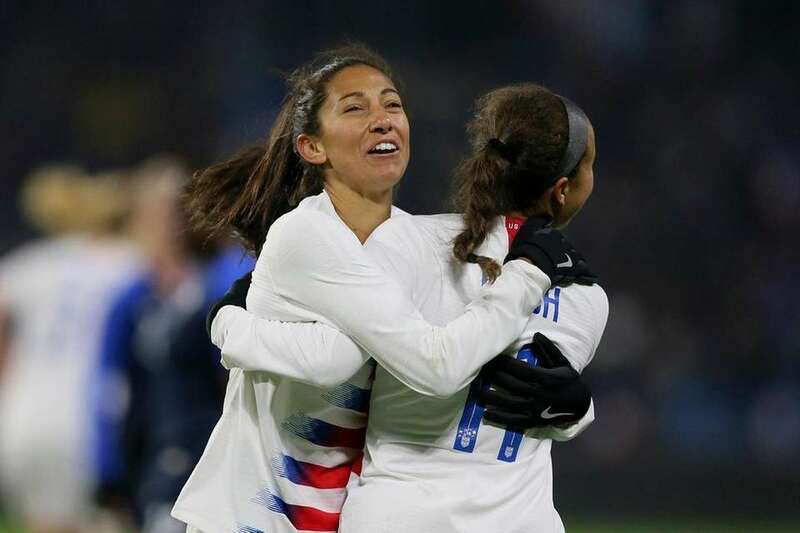 U.S. forward Mallory Pugh, right, celebrates with teammate Christen Press after scoring their side's goal during a women's international friendly soccer match between France and the United States at the Oceane stadium in Le Havre, France, Saturday, Jan. 19, 2019.